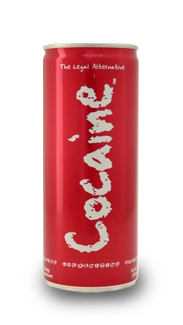 Cocaine is a highly caffeinated energy drink which claims to be 350% stronger than other energy drinks, including Red Bull. However, the producers of Cocaine also claim that consumers will not experience the typical "sugar crash" or jitters with Cocaine, which other energy drinks often produce. Its controversial name comes from the makers' claim that the drink is a legal alternative to the drug. The product is currently being sold at select stores in New York, Los Angeles, Dallas, Florida, and Connecticut, however it has received inquiries about being sold in Britain and throughout Europe. Each 8.4-ounce can of Cocaine contains 280 milligrams of caffeine, more than twice the amount in a cup of coffee, and a throat-numbing blend of fiery spices.